Some people call these Mexican Wedding Cookies; others I know call them Russian Teacakes. I'm sure there are even more names for them. And there are different shapes, including flatter cookies than the spheres I make. Last month a friend who has gone gluten-free over the past several months tried a recipe she'd found for gluten-free Mexican Wedding Cookies. She wasn't entirely happy with the recipe, so I thought I'd see what I could come up with here in the Delightful Repast Test Kitchen. This is a cookie that is supposed to be quite crumbly, but not as crumbly as a gluten-free version would be without a little help from xanthan gum and extra moisture. When I make these with regular flour I never add more than a teaspoon or two of water. With a gluten-free blend, that is not nearly enough. I settled on 3 tablespoons and a rest of at least an hour to give it time to absorb the moisture. I'm wondering if using 3 tablespoons of beaten egg might not be even better, but I'm out of nuts and so can't make a second batch. What do you think? Egg or water? BTW, did you know January is National Hot Tea Month? These cookies go beautifully with tea, so be sure to have a Proper Cup of Tea! 1 In small bowl, whisk together gluten-free flours/starches, xanthan gum (or regular flour) and salt. 2 In medium bowl, beat butter with electric mixer until creamy. Add 1/4 cup powdered sugar; beat for about 1 minute until light and fluffy. Add flour mixture, nuts, water or beaten egg (for gluten-free version) and vanilla; beat to a soft dough. Shape the dough into a log, wrap tightly and refrigerate for 1 hour or overnight. 3 Preheat oven to 350F/180C/Gas4. Cut chilled dough into 12 equal* pieces and roll into balls. Place 2 inches apart on cookie sheet sprayed with organic canola oil cooking spray or lined with parchment. Bake until cookies are pale golden, about 16 to 18 minutes. Cool on wire racks. Roll cooled, but still slightly warm, cookies in 1/3 cup powdered sugar, coating well. Let cool completely, then roll in the powdered sugar a second time. * If you reallyreallyreally want the cookies to be exactly equal, weigh the dough (this batch was 12.875 ounces/366 grams) and divide by 12, about 30 grams or a bit over 1 ounce. OR make 24 cookies half that size and bake them for about 12 to 14 minutes. Store at room temperature in airtight container. I would go for egg white. These look awesome, Jean. Thanks, Angie! And that sounds like a good idea. Dany, thank you! I do think it's a cookie that suits your style! I call them snowballs (though no one else does, I’m sure) and I vote for egg over water. Egg is the fifth fundamental force, the glue that binds the universe, the stuff you get on your face when you opine and don’t know what you’re talking about…like me right now. And I’m really impressed by the way you just tossed out that “xanthan gum.” Can you actually buy that stuff? I thought it was only available from George Lucas in an alley on a dark night. Actually, Sully, you DO know what you're talking about! 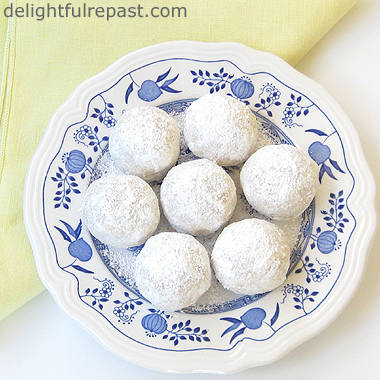 They are called "snowballs" in some circles, and it is actually the name I rather prefer. Thanks for the egg vote. But what makes you think I *didn't* get my xanthan gum from George Lucas in a dark alley?! Nice to meet you Jean! I did not know that January is National Hot Tea Month, I love tea! I loved your tips. Thank you and a big kiss! And nice to meet you, Silvia! *Every* month is Hot Tea Month at *my* house! Oh yum! I LOVE these cookies! I typically use walnuts, so I'll have to try the pecans. Thank you for the gluten-free alternative! Melissa, thank you! I do hope you'll try the gluten-free version and let me know what you think. Sometimes I use walnuts, too. Good either way! Greg, I'm thinking of switching to calling them 'snowballs' myself, because I make them spherical. Your cookies look so yummy Jean! Have a nice weekend. Thanks, Julie! I AM going to have a nice weekend--my painter should be finishing up the room this weekend! yay Jean! Thanks for posting a gluten free recipe! The cookies look divine. Thanks, Joanne! You'll find quite a collection of gluten-free recipes on my Recipes index page under the subheading "Gluten-Free." Enjoy! Cool, Elsie! It IS easy to just keep on having another! I must say they do look good. Thanks, Margaret! The gluten-free version tastes just like the regular one. Whatever you call them, they are always a favorite for teatime. Great recipe version! Thanks for linking to Tuesday Cuppa Tea! I LOVE these cookies. So yummy! Ruth, thank you! I have just one left from the last batch -- saving it for tea this afternoon! Jess, if you have any gluten-free friends and make these for them, they'll be your friends for life! Those do look wonderful and what a nice gift that would make for a gluten free friend! Thanks so much, Bernideen! People with food allergies/sensitivities are always so appreciative when someone makes something they can eat. Yes, Judy, especially if packed with pecans! I understand that you do not use wheat flour because it contains gluten. However, I am a little confused about your use of three types of flour, coconut, sorghum and tapioca.Do they each counteract the flavour of the other? I have some bad memories of tapioca puddings as a child. I hated the texture and it always made me want to throw....(i won't finish that sentence.ha! Ha!) It just seems strange, that since farming began, probably around 5000BC, different forms of grasses were developed into wheat and barley and so forth and people for thousands of years have been eating wheat so what is now the big deal? I have always been taught that all we need is a balanced diet for good health. Tony, thanks for the question. I do eat wheat as I'm not bothered by gluten. But several of my friends, though not celiac, have sensitivity to gluten and follow a gluten-free diet. So I've developed recipes for them. There is no single gluten-free flour or starch that by itself is an adequate substitute for wheat in recipes, so a combination is always used. I use various combinations, and this is just one that I've come up with. Tapioca flour/starch is an entirely different texture than the tapioca pearls used in tapioca pudding. (I *love* tapioca pudding, by the way!) It's rather like cornstarch/cornflour. Whatever they're called I know I love them. One of my favorite cookies, and I've not made them for years. Thanks for the reminder to get that oven cranked up. Thanks, Lea Ann. Can't wait to make more! Jean, your cookies look lovely. You know I have never had one that I can remember and I have always been curious about them. Now that you've shared your recipe perhaps I can try making a batch. Only problem is my hubby doesn't care for powdered sugar on anything. These actually remind me of Swedish Butter Balls which I usually make for Christmas. Pretty and melt-in-your mouth good! Thank you, Sandi! I usually make the things my husband prefers, but once in a while I'll make something he doesn't and share it with a friend. I tell him, "It isn't always about you," which makes him laugh because he knows I adore him! I like them a lot, you made it beautifully, my daughter love them. Thanks for remembering me to make another batch pretty soon and also for sharing with Hearth and soul blog hop, pinning and tweeting. Swathi, thank you. Of course, they don't require the precision of your opera cakes! But I like to make them exactly the same size and as spherical as I can get them. Your pins and tweets are soooo appreciated! Whatever name you decide to call these pretty cookies, they look delicious, Jean! I think I would use egg instead of water if it was me but I do love what you've done with this recipe. There's something wonderful about a lovely, light, sugar drenched cookie like these! Thanks, April! I am looking forward to trying a little egg in the next batch. Hope you're having a cozy January! I love these cookies, Jean, and now you have me wanting to make some! I didn't make any at Christmas this year, but they're such a wonderful cookie for any time, and with a cuppa tea, a perfect treat! Yum!! Kitty, thank you. Put the kettle on and I'll bring the cookies! Thanks for the comment on Sweetwater Style. I hope you had a thoughtful MLK Birthday Holiday. I think the best part of that holiday is taking time to reflect on ways that we can live his dream. I am a new follower BTW! Thanks so much, Mary! I look forward to visiting Sweetwater Style regularly! Jean, you're a dear for testing out this recipe for your friend. I'd say next time all the ingredients are present, try the egg for added moisture/binding just so you know how it will fare when baked up. Thanks for weighing in, Brooks. I have a feeling, too, the egg will work even better than the water for keeping the characteristic "crumbliness" to the proper level! I just love these cookies and your recipe looks fantastic! Thanks so much for sharing with us at Full Plate Thursday this week. Hope you are having a great day and come back soon! Miz Helen, thank you so much! AND for hosting Full Plate! Karen, thank you so much! I'm so glad you made (and liked!) the Boeuf Bourguignon. Can't wait to read your post! I think I have tried the Mexican wedding cakes before. I love baking and experimenting in the kitchen. I wouldn't mind baking the who,e day as ,long as there is no time limit or pressure. Well I guess I will be drinking more cups of tea than ever this month. Thank you for sharing. Aida, thank you for visiting! Baking when there is no time limit or pressure makes the best kind of day.